We have previously covered the antics of private company ATOS Healthcare who carry out ‘health-checks’ on behalf of the Dept. of Work & Pensions. Job Centres are making daily decisions on huge numbers of people currently on disability benefits (Employment Support Allowance) with the aim of tranferring them on to Job Seekers Allowance if they are deemed fit enough, using a very contraversial computerised testing procedure owned by ATOS. Secret filming of ATOS ‘training’ by a GP has revealed that there is an implicit quota to pass recipients of benefits as fit for work. ATOS is paid a vast sum to carry out the tests. 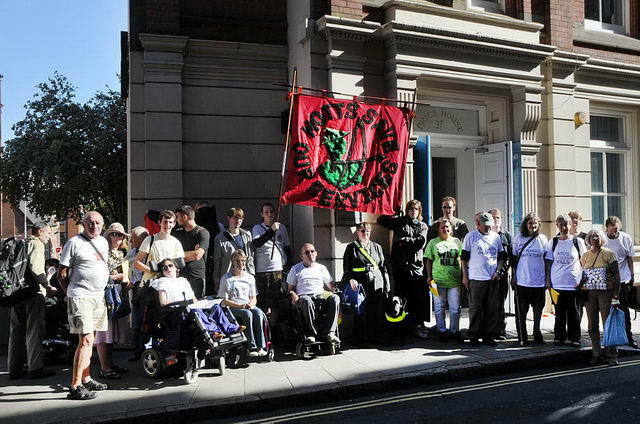 Notts activists have taken action against ATOS locally. The story of one part of this can be found in the excellent pamphlet: ‘Too much of this sort of thing’. Protests against workfare took place on 7-14 July across the UK in a week of action called by the Boycott Workfare network to escalate the campaign against forced unpaid work. Another hugely successful and diverse week of action across the UK, saw actions in over twenty locations across the UK, hundreds of people step up the pressure with phone calls and online action, and even an Early Day Motion tabled in Parliament. Holland & Barrett pulled out of workfare the day before its stores were to see more protests across the UK. The week ended as it began with yet another big high street name wavering in its use of workfare. Savers have said that they will use the people currently doing workfare until their placements expire, but it will not be taking on any new workfare workers, until it has spoken to ministers about concerns that if people refuse to they will have their benefits stopped. Let’s hope they don’t buy the government’s line that the placements on the Work Experience scheme are now voluntary. Sanctions have only been temporarily suspended. People are still told that they risk losing benefits if they do not go on the scheme, and people who refuse are threatened with a mandatory scheme instead. So we will be keeping an eye on Savers. They wouldn’t be the first organisation to publicly claim that they have pulled out of workfare, only to sneak it back in. Which takes us to Scope. Sadly, Scope continues to use workfare and has been cited by the government to help it promote its Mandatory Work Activity Scheme. You may like to contact Scope about this and what appear to be its attempts to mislead people over the scheme and the Boycott Workfare campaign. We call on all those charities still involved to pull out. Workfare is failing and is hugely unpopular with the general public. By supporting the Work Programme you are linking your organisation to a deeply unpopular policy which undermines social justice. It’s not just our campaign that is making workfare wobble. Every time figures are published, the Work Programme is exposed as failing. So much so that banks are now refusing to lend to workfare profiteers. It’s just too risky. A4E sub-contractor Eco Actif suddenly collapsed on Friday morning when it ran out of money. Boycott Workfare thanks all those people and organisations who took part in and supported the week of action. To our new friends we say welcome. This campaign is what you make it, it’s your campaign, its achievements are your achievements. And one person managed to photograph a list from their job centre including: Stead & Simpson, Travis Perkins, Peacocks, Modern Classics, and Music4Children. There’s more to do, this campaign is making a real difference, so take action with us to help it win! This week, after the national week of action, activists in Nottingham handed out anti-workfare leaflets at local Job Centres. Two leafletting sessions were drowned out by the rain during the week of action!